Its Twitter announcement was accompanied by the incredibly creepy image of Mario yanking back a shower curtain so he can watch you scrub your naughty bits. Hey, I’m as excited as the next gamer to learn something, ANYTHING, about the NX but what the heck is with that image? 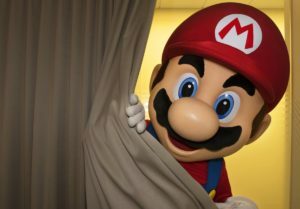 Feel free to leave your guesses in the comments below then try to sleep tonight with the knowledge that Mario is watching you. I’m guessing several developers are waiting on the reveal of the NX’s official name so that they can announce their own games for the system. Wouldn’t it be something if we saw the NX’s official name and logo on tomorrow’s Red Dead Redemption 2 trailer? Square Enix has already announced they’re bringing Dragon Quest XI to the system, so the name alone doesn’t have to hold companies back (unless it’s like the Super Nintendo or N64 where part of the console name is in almost every game’s name). Saw a lot of that with the DS, too. Though some of them tried to at least be a little clever with it, having the DS actually stand for something, like Castlevania Dawn of Sorrow. And Dragon Quest X and Ubisoft has announced Just Dance 2017 and Nintendo has announced Breath of the Wild. Despite my sloppy wording, I didn’t mean to imply that games couldn’t be announced until the system had a proper name, just that some wouldn’t make their announcements until it did. Honestly, I wouldn’t mind if they kept the NX name.Same as I wouldn’t have mind them keeping the name Revolution for the Wii. Then again, this is Nintendo, they pass by good names sometimes. Super Smash Bros for Wii U/3DS, really? Let’s see, we had Smash Bros, Melee, then Brawl, and for the fourth you went with the console identifier instead… They could have used the name I’ve been throwing at them for a Smash Bros title: Royale. And it would have worked too! considering the 8 player matches it can do. With SSB, I think it’s because they wanted the pun on for/4… which almost everyone missed. People might have gotten it if it had been titled eg. “Super Smash Bros. 4 Wii U” instead, but they didn’t go for that, and the pun was lost. Maybe it’s for the better.